October 13, 2011 - NASA transferred title and ownership of space shuttle Endeavour to the California Science Center (CSC) during a ceremony Tuesday at the center in Los Angeles. The transfer is the first step toward CSC receiving Endeavour in the latter half of 2012. "NASA is pleased to share this wonderful orbiter with the California Science Center to help inspire a new generation of explorers," NASA Administrator Charles Bolden said. "The next chapter in space exploration begins now, and we're standing on the shoulders of the men and women of the shuttle program to reach farther into the solar system." Bolden announced April 12 that CSC was one of four institutions nationwide to receive a shuttle. After display preparation and post-mission work are complete, NASA will deliver Endeavour on the 747 shuttle carrier aircraft to Los Angeles International Airport. From there, the shuttle will be driven through the streets of Los Angeles to its destination at the Science Center in Exposition Park. "Endeavour now will begin its new mission to stimulate an interest in science and engineering in future generations at the science center," California Science Center President Jeffrey Rudolph said. Space Shuttle Endeavour (Orbiter Vehicle Designation: OV-105) is one of the retired orbiters of the Space Shuttle program of NASA, the space agency of the United States. Endeavour was the fifth and final spaceworthy NASA space shuttle to be built, constructed as a replacement for Challenger. Endeavour first flew in May 1992 on mission STS-49 and its last mission STS-134 was in May 2011. The STS-134 mission was originally planned as the final mission of the Space Shuttle program, but with authorization of the STS-135 mission, Atlantis became the last Space Shuttle to fly. The United States Congress authorized the construction of Endeavour in 1987 to replace Challenger, which was lost in the STS-51-L launch accident in 1986. Structural spares built during the construction of Discovery and Atlantis, two of the previous shuttles, were used in its assembly. NASA chose to build Endeavour from spares rather than refitting Enterprise or accepting a Rockwell International proposal to build 2 shuttles for the price of one of the original shuttles, on cost grounds. The orbiter is named after the British HMS Endeavour, the ship which took Captain James Cook on his first voyage of discovery (1768?1771). This is why the name is spelled in the British English manner, rather than the American English ("Endeavor"). This has caused confusion, most notably when NASA themselves misspelled a sign on the launch pad in 2007. The name also honored Endeavour, the Command Module of Apollo 15, itself also named after Cook's ship. Endeavour was delivered by Rockwell International Space Transportation Systems Division in May 1991 and first launched a year later, in May 1992, on STS-49. Rockwell International claimed that it had made no profit on Space Shuttle Endeavour, despite construction costing US$2.2 billion. On its first mission, it captured and redeployed the stranded INTELSAT VI communications satellite. The first African-American woman astronaut, Mae Jemison, was brought into space on the mission STS-47 on September 12, 1992. In 1993, it made the first service mission to the Hubble Space Telescope. 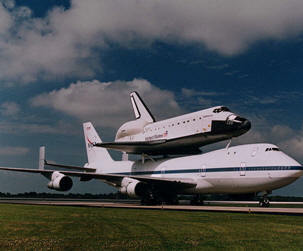 Endeavour was withdrawn from service for eight months in 1997 for a retrofit, including installation of a new airlock. In December 1998, it delivered the Unity Module to the Zarya module of the International Space Station. Endeavour flew its final mission, STS-134, to the International Space Station (ISS) in May 2011. After the conclusion of STS-134, Endeavour was formally decommissioned. Endeavour was originally scheduled to be decommissioned in 2010 after 18 years of service, but on July 1, 2010, NASA released a statement saying the Endeavour mission was rescheduled for February 27, 2011, instead of late November, 2010.